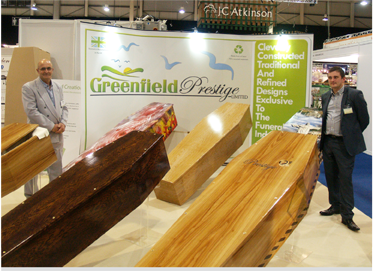 Launched at the national funeral exhibition June 2013 Greenfield Prestige is a modern approach to the increased demand for environmentally friendlier coffins and more personalised funerals. Prestige coffins are manufactured from at least 98% cardboard and paper of which 70% is made from post consumer waste (recycled paper). The final coffin is lighter than an average wooden coffin using 40% less material to manufacture. Greenfield Prestige is a British manufactured coffin. Our cardboard coffins are made in the East of England, where for the past 23 years we have been manufacturing cardboard coffins using materials sourced from British suppliers, helping us to reduce our carbon footprint and also supporting the UK economy. Demand for more personalised and non religious funerals is on the increase, setting a trend for a more fitting/personalised funeral, celebrating the life of your loved one. Greenfield Prestige has developed a unique easy to use coffin designer so families and their funeral directors can provide a beautiful personal picture tribute for the loved one they are making the arrangements for. Why? And what’s so different? Cardboard coffins are not new to the funeral industry or to the Greenfields group who have been producing them since the company was founded in 1989, however the new prestige range have a very unique advantage in their style and design. Late in 2012 I sat down with my team and set them the task to redesign my cardboard coffin and gave them a list of areas were I wanted improvements made to bring the ascetics of product up to the expectations of the modern customer and funeral industry, and am proud to say that they have raised to the challenge and superseded what I expected or even thought possible with a cardboard coffin. All the coffins on this website are made from cardboard ink and corn starch glue.